experiences that bring a sense of aliveness to my body. Sometimes, at the end of the day I use this layout to either record these experiences, or to mindfully review with memory what I did not stop to notice in the moment. 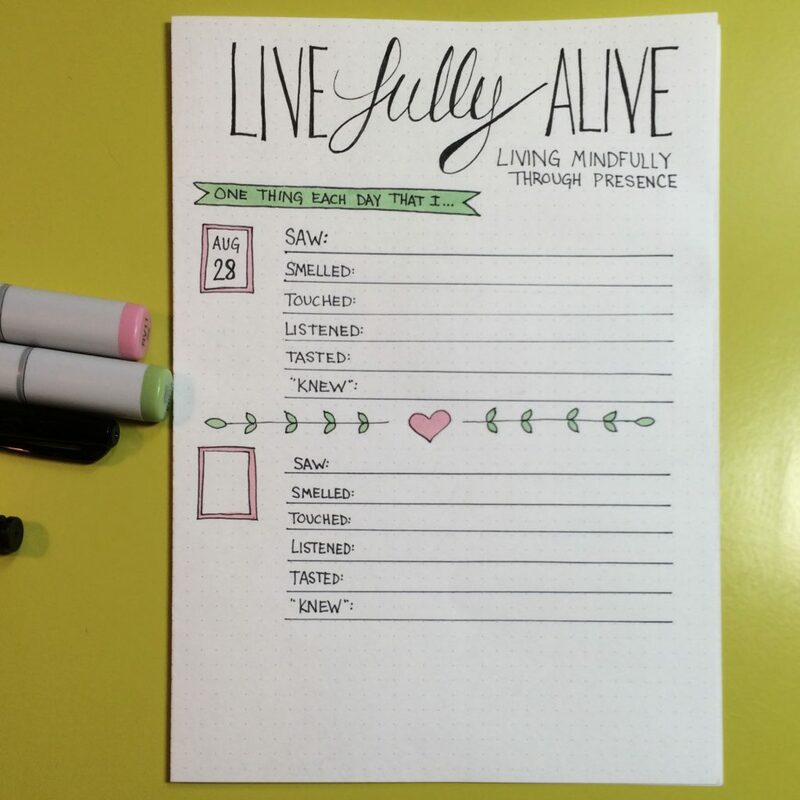 This journal layout can be used as easy end-of-the-day reflection exercise to allow you a few moments to slow down and process a bit of what your mind and body experienced during the day. Sensory experience is just one type of mindfulness, but it’s been the most helpful for me. 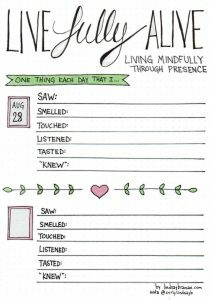 My hope is that through the habit of this layout during your journal times, you might begin to mindfully notice sensory experiences in the midst of your day. HOW TO USE: As you complete this layout, take a few moments to remember and notice the sensory experiences and the experiences surrounding them. For example: For “Listening”, think: What was the sound? When did you first notice? What emotion did it bring up? Did you strain to hear or was it so loud it drowned out other sense? 6th Sense: YES. I include a 6th sense: “knowing” or intuition. Humans have an innate ability to read people, situations, and our environment. If we pay attention, it helps keeps us safe and helps us to know how to care well for others. Most of us don’t pay attention to our intuition- we were taught long ago to ignore our body’s cues and “be nice” instead of practicing reading a situation well and trusting our instinct. Fostering the habit of naming and honoring your inner ability to read a person or situation correctly can improve your sensitivity and trust in your own intuition, and trusting your intuition can save your life. Is Mindfulness Really Worth Journaling About? 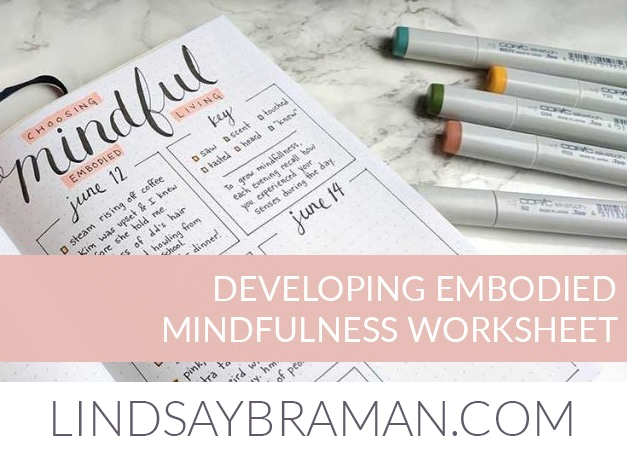 It’s worth noting that there is a big, big difference in coloring and mindfulness- doing the activity of coloring is not, in itself, a mindfulness practice, but is a way many adults find it helpful to slow their mind to move into a space of mindfulness. Coloring as a distraction from life or a way to “check out” after a long day may have it’s benefits, but is not mindfulness. Mindful coloring means slowing down and taking time to be aware of all five sense, notice what you are sensing, and letting what you notice pass in and out of your awareness without judgement or reaction. This is actually a very good idea! We often focus on the bigger things in life and forget about the small happy things in life! Thanks for your lovely idea!